These pictures were taken yesterday 10th of February 2019 in Tanji, The Gambia. Mountains of Bonga fish are waiting next to the road to be transported and processed by the Golden Lead Factory in Gunjur. This is happening on a huge scale while the average Gambian goes to bed hungry every night. It’s the sad truth of the ‘New Gambia’. The government and the factories claim they are creating jobs and this should be seen as development. The hard truth however is that none of these factories are offering a lot of jobs. The working conditions for Gambians are below any standards. While the Chinese employers that are working in the same area are wearing protective clothing. The few jobs that are generated by the factories are nothing compared to suffering that local villages have to endure. The environmental damage these factories have caused are beyond any ones imagination. 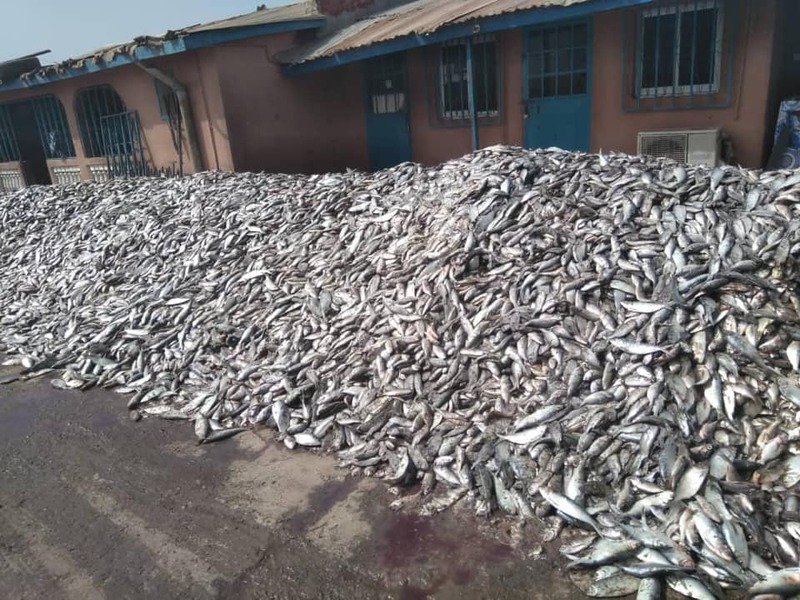 Overfishing caused by foreign fishmeal factories is a huge problem in the food security of The Gambia. The price of fishmeal have never been as high as it is today. The foreign run factories are making unbelieveble amounts of money. All of the processed fish is exported straight back to China. This fishmeal is used to feed pigs on China’s mega farms. 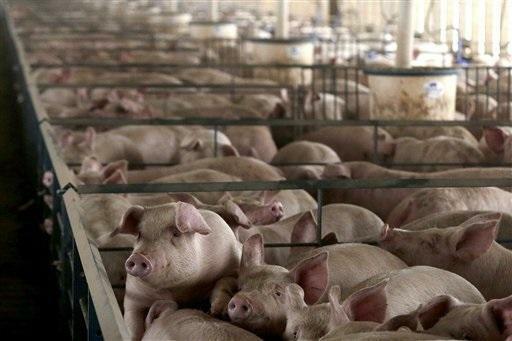 Fishmeal is used to feed millions of pigs in mega farms in China. Local fishermen rather sell their fish to the Chinese owned factories, instead of the local markets. This is because the fishmeal factories give the fishermen a better price for their fish. Instead of piles of fish that used to go to local markets, these same piles of fish are now waiting to be picked up to be processed to pig feed. The only source of protein is becoming scarce and has become unaffordable for local people. This will affect the health of Gambians. 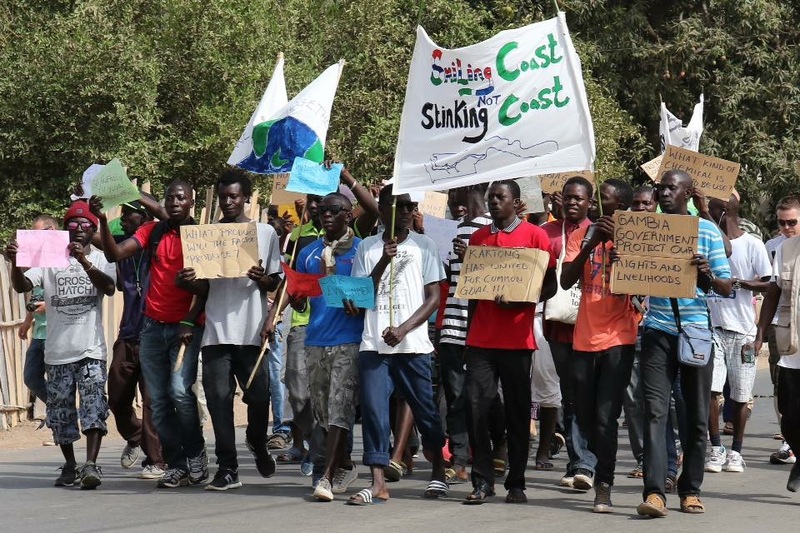 A protest of local youths against the fishmeal factory in Kartong, The Gambia. Picture by: Mr. Collins. Foreign investors are literally stealing the last fish of the poorest people of the planet. The saddest thing is, that the three fishmeal factories that are now operational, are fully supported by the Gambian Government. 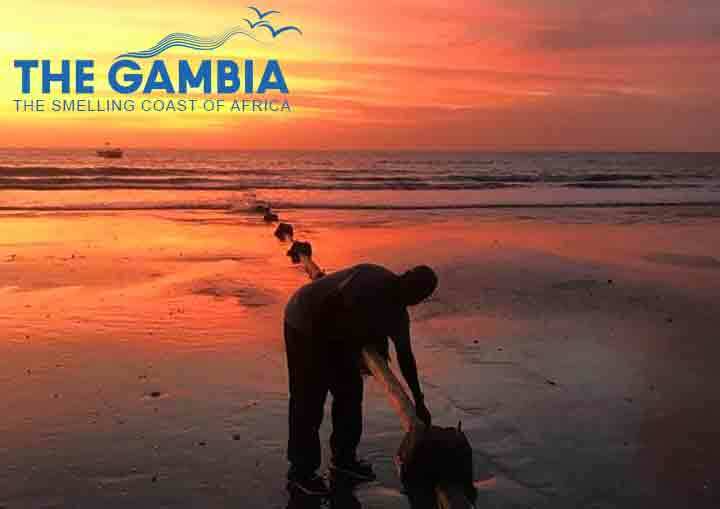 In a radius of 14 KM three fishmeal factories have received permission from the Gambian government to dump large amounts of untreated waste water into the ocean. This waste water contains high concentrations of arsenic acid which are famous for causing cancer. This waste water is not only threatening the health of Gambians but also the tourist who are swimming in this same water. In the village Gunjur, people already have shown up with skin infections after they had swim in the ocean. Local people are fearing the worst and see the fishmeal factories as a serious threat to their health and future. Their Bolong Fenyo Wildlife Reserve has been poisoned by the acid last year. A true shock for the local population. Goats, are drinking this dangerous water and it’s even in the grass that the goats eat. Many are afraid that this arsenic acid already has ended up in their food chain since the fishmeal factories are operating. Right now, all species of fish are declining in an alarming rate and some are already on the brink of extinction. Senegalese fishermen explained that if nothing is done to protect West-Africa’s fish stocks by it’s governments, piracy will soon be a real option. Local fishermen in West Africa feel themselves forced to take their rights into their own hands as their governments are failing them. We risk having a civil war here. In Senegal we have problems finding food, so we have to find a solution. We could even become pirates with these boats. Anything can happen, I tell you. Senegal has been a stable country, until now.. But now we are really threatened as foreigners come over and take our resources. How can we trust politicians and a Government who cannot defend our basic fundamental rights to a clean environment and livelihood? How can we forget, growing up and seeing our mothers walking under hot sun going to rice fields, vegetable gardens and at the beach to provide for the family and put food on the table? Take a look in Golden Lead Fishmeal factory. This is just a moment of one day. 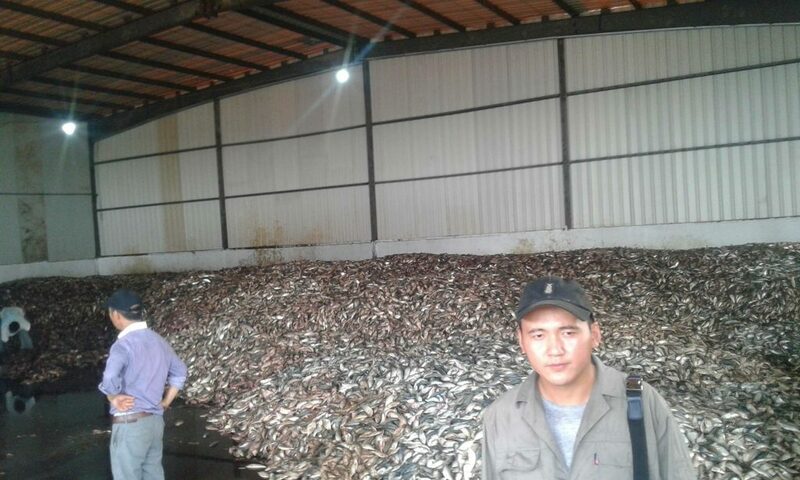 Imagine, every day this amount of fish is taken away from the poorest of our planet. Picture by one of our activists. The bonga fish and other pelagic fisheries that our poor coastal communities depends on their livelihood are being over exploited by Fishmeal Factories to meet on demand of China whilst depriving our hungry people their cheap source of protein, and income to send their kids to school, pay their medical bills? Who speak for the poor people or are we taking them for granted that they are uneducated and didn’t know how Government is being run? How can we trust politicians and our Government who cannot defend our basic fundamental rights to clean environment and livelihood? This picture here was send me three days ago by a brother from Brufut taken at Tanji beach! The fisherman said he is waiting for a truck to transport the fish to Gunjur Fishmeal factory- Golden Lead! How come our Government- including the fisheries and environment experts cannot recognize that this kind of investment are not only unsustainable but also a threat to our economy, environment, health and our livelihood?